When it comes to seasoning your food, nothing really compares to the taste of fresh, cracked pepper. Of course, you only get to enjoy this delicious flavor if the pepper has been ground to perfection – this is where the pepper mill comes in. Although pepper mills have been around for as long as anyone can remember, you will have to agree that they are not all created the same. There are far too many products that either stall or produce a powder that is just not suitable to use. For a superior taste, you need a pepper mill that can be loaded easily, has a good grinding mechanism and is simple to use. Since this can be a lot more time consuming than you can imagine, we took on this task for you. Here is what we found when we went looking for the best pepper mill. This pepper mill is definitely a blast from the past. The manufacturer utilizes a design that has been used for hundreds of years. Well, the good news is that they have used it to great success – this is a pepper mill that works well to grind your pepper to a fine powder. There is a tool setting grinding mechanism that allows you to regulate the fineness of the grind. Now, this mill produces a fine, high-quality pepper powder. The perks of this are that you get to enjoy a burst of fresh and intense flavor that adds an instant punch to any meal. Unfortunately, if you want slightly larger pieces, this isn’t the mill for you. It isn’t able to produce larger, cracked pepper pieces. One of the things that do stand out about this mill, however, is the construction. It has an all-metal body that actually looks quite good. This means that this is a pepper mill that is going to last you a long time. To put it off, it is very stable too all thanks to the flanged bottom. So, you can place it on any tabletop and be sure that it won’t topple over. 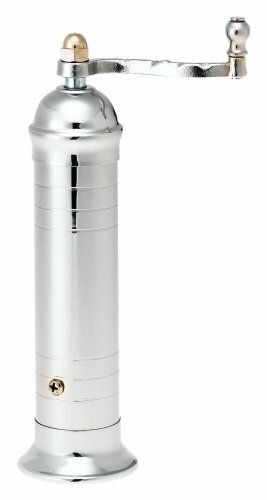 One of the features that really stands out about this pepper mill is the two-stage burr-style system. Here, the pepper is first cracked before it is ground into a finer powder. The advantage of this process is that you get to sample a much better taste. This is because a greater amount of flavor is released. The grinding mechanism on this pepper mill is also fully adjustable – this means that you can fine-tune the settings so that you can choose just how fine or coarse you want your pepper to be. The mill is also easy to fill up with peppercorns as the top can be quickly removed and the mill replenished. If you are looking for a tabletop mill that you can show off, then this one definitely falls into this category. It has excellent aesthetic appeal and looks incredibly high-quality. The only downside is that due to the wood exterior, there is no way to say just how durable this mill is so you do need to be careful with it. For instance, if you drop it, there is a chance that it may crack. All of the metal parts of the mill, however, are made from top-grade steel, ensuring that they will continue to work well for a long time. There is no denying that this is a really great-looking pepper mill. It has a stained wood housing that is perfect for the table or when you have guests over. Of course, this isn’t the only advantage of this mill. The interior is just as well made. In fact, unlike many other pepper mills, this one has ceramic mechanisms rather than plastic. Not only does this mean that the mill is longer lasting, it is also safer. So, if you don’t like the idea of using plastic, this is the mill for you. As for the actual grinding mechanism, it is fully adjustable. Just by turning the top knot, you can change the coarseness of your grind easily. So, whether you are cooking or just seasoning a dish, you can alter the settings accordingly. You should know, though, that this isn’t the easiest mill to use. At times, it will require some serious effort so it isn’t the best option for someone who doesn’t have a lot of upper body strength. It is rather simple to fill up the mill, however. The top easily comes off, allowing you to quickly top up the reserve. If you want a slightly more modern take on the pepper mill, then this model is a good option for you. One of the biggest advantages with this mill is the non-slip, oversized handle. 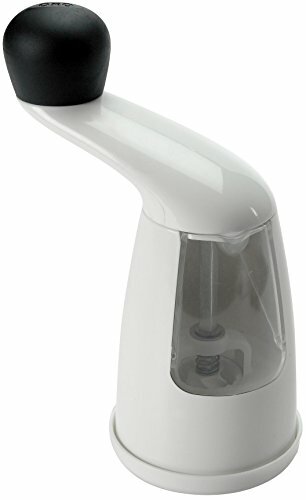 It is easy to grip and turn, making a lot easier for you to grind your pepper, especially if you have difficulties such as arthritis. The only downside is that the rest of the pepper mill body isn’t as easy to grip. As it is made out of plastic, it can be rather slippery to use, making it difficult to cook with. However, what we did like about this mill is that you can see the peppercorn reservoir as it is completely transparent. This way, you can immediately tell when you need to refill it. This, too, is simple as it is just a matter of undoing the latch and adding as many peppercorns as you need. Now, the interior mechanism for this pepper mill is made from ceramic which does make it a lot more hygienic and durable than plastic. This mechanism is adjustable and you can change it according to the grind that you want. So, this is suitable for all kinds of dishes, regardless of whether they call for a coarse or fine grind. If you don’t have a lot of patience and you want your peppercorns turned to powder as soon as possible, then this is the mill for you. The superior grinding mechanism of this mill is what makes it an absolute breeze to use. With just a few turns, your pepper will be crushed to perfection. Speaking of the grinding mechanism, this is an adjustable function. The thumbscrew at the bottom of the mill can be adjusted so that you can opt for either a coarser or finer grind, depending on what you need. The other advantage is that this mill can easily be filled up as it comes with a sliding side mounted loading ring. This allows you to quickly fill up the reservoir when you are running low. What is really fortunate that even when you are filling the reservoir, the settings on the mill don’t change. So, you can use it without having to remember to change it back to your preferred grind. The only real issue with this pepper mill is that the entire body is made from plastic. This means that it can get a little slippery especially if you are trying to use it with wet hands. 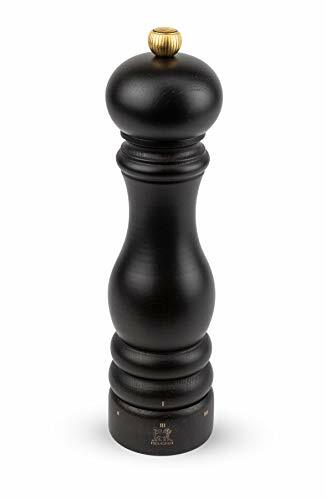 Pepper mills are typically categorized according to the materials that they are made of. Here are the three most common types of mills on the market. Steel Mills: these are the traditional types of mills and are also the most common. Now, for the most part, steel pepper mills work rather well. They are strong enough to grind the pepper finely and hold up well to continuous use. The main issue with these mills is that they can sometimes add a metallic taste to the pepper. Also, there is always the chance that the steel portion will get corroded if it is continuously exposed to moisture. Plastic Mills: over time, these mills replaced many of the steel ones as they were impervious to corrosion. Of course, these mills are nowhere near as strong and tend not to last very long. So, they aren’t of the highest quality. There are also a lot of people that are wary of using plastic with their food as they feel that it is unhygienic. Ceramic Mills: ceramic mills offer the best of both worlds. On the one hand, it is incredibly strong – enough to grind the pepper into a fine powder. At the same, it is non-corrosive and completely hygienic as well. You will notice that there are two different designs for the cranking systems on pepper mills. The first has a long arm that has a knob at the end. The second mechanism is where the crank is a part of the top of the mill and looks like a knob as it is often dome-shaped. So, which one is better? Well, this really depends on how much pepper you want to grind. If you only want a small amount, you will find that the knob will work just fine for you. However, if you want a lot of seasoning, then the handle-and-crank design offers you a lot more leverage. Depending on what you are cooking or seasoning, you will need a different grind consistency. This is why it is important to consider whether your pepper mill has an adjustable grinder. Now, a lot of mills come with adjustable settings. However, you need to make sure that these settings actually produce the fineness or the coarseness that you require. This means that there should be a noticeable difference in texture from one setting to the next. The other thing to consider is the consistency in the mill output. Every time you turn the crank or the knob, the mill should produce the same amount of pepper. Why is this important? Well, if you can figure out how much pepper is dispensed with every few rotations, in relation to teaspoons, you can find your own measuring mechanism. This makes cooking a lot easier for you. Peppercorns can be rather tricky due to their shape so it is best to look for a grinder that has a chamber that is easy to fill. The first thing to look for is the positioning. The opening to the chamber should be conveniently located so that you can pour the peppercorns without making a mess. On a similar note, the opening should be large enough so that you the peppercorns will not spill, as you are attempting to place them in the reservoir. Reservoir Size: it is important to always choose a pepper mill that works for you. For instance, if you only want one to season the dishes at the table, then a smaller reservoir will work. However, for cooking, you will find that you will need a larger chamber. 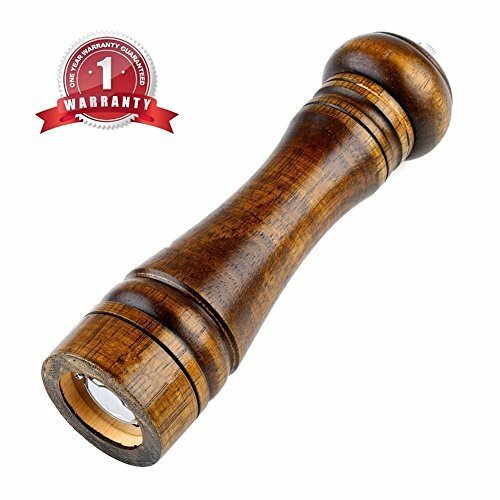 Housing Material: since you will need to get a good grip on the pepper mill, it is essential to look for that has a textured, non-slip housing. This is especially important if you will be using the mill for cooking purposes. Aesthetic Appeal: if you want to keep the grinder on the table where it will be prominent, you should make an effort to choose one that is made from high-quality material and that looks good. So, to sum things up, when looking for a pepper mill, you should always opt for one that is easy to use, easy to fill and provides you with reliable grinding results. If you want an affordable pepper mill, the OXO pepper mill will offer you the best value. On the other hand, if you are looking for something that is sleek and consistent, the Unicorn Magnum pepper mill is the right choice. If you want pepper mills that work well for aesthetic purposes, you will find that the UMIKAkitchen and Peugeot will be right up your alley. Last but not least, the Pepper Mill Imports model is ideal for anyone who needs a proper workhorse. So, with all of this information at your fingertips, you are sure to have no trouble finding a pepper mill that is ideal for you.